Over the years, I have heard many submariners say that a boat changed their life. For some, it was because the boat was their qualification boat. The completion of a hard and grueling period in their life when they were required to find an inner strength that they didn’t think they had. 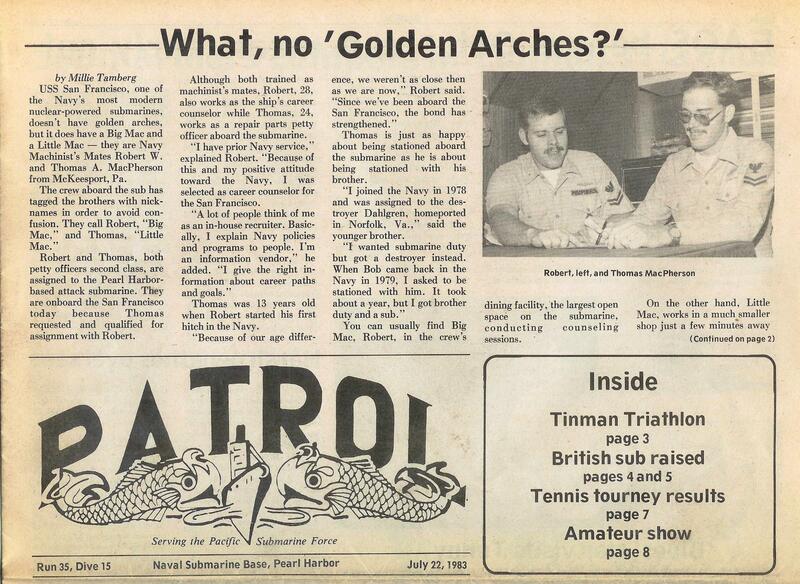 Earning your “fish” is one of the most significant parts of any submariner’s life. It is a balance between personal achievement and realizing that you are now one with the many sailors who earned it before you. The first time you climb down the ladder into the boat, you are surrounded by the sights, sounds and smells that make being on a submarine a unique experience. Since most of us went to sub school first, we are already aware from the trainers that we will have to learn the location and significance of every single valve, power panel, and emergency air breathing station. Since a submarine becomes a sealed messenger of death with no possible escape in wartime, you have to learn to fight in the dark and battle casualties without thinking about your own safety. All of those things combined with the closeness of the crew make submarining the experience of a lifetime. But for many, one boat always stands out as unique above the rest. 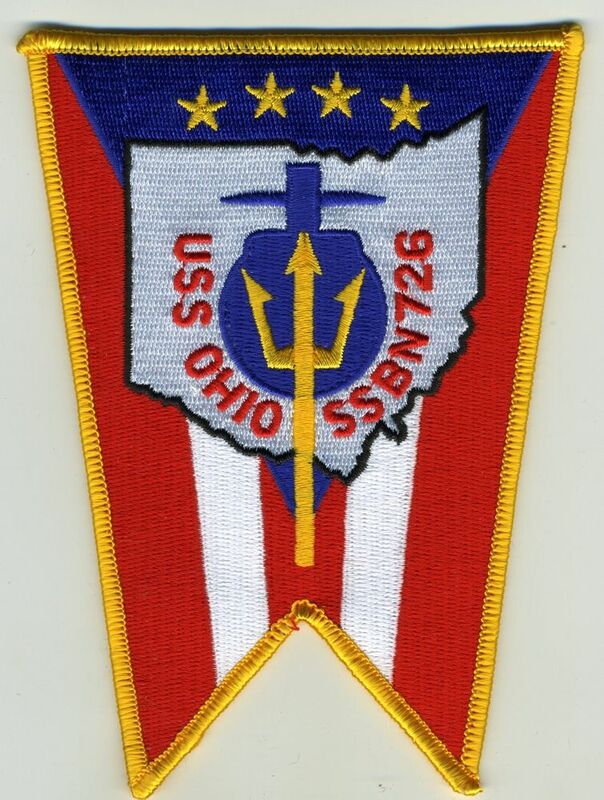 While I am grateful for the men who taught me on my first two boats, it was on my third that I truly learned about the life of a submariner. That boat was the San Francisco (SSN 711). 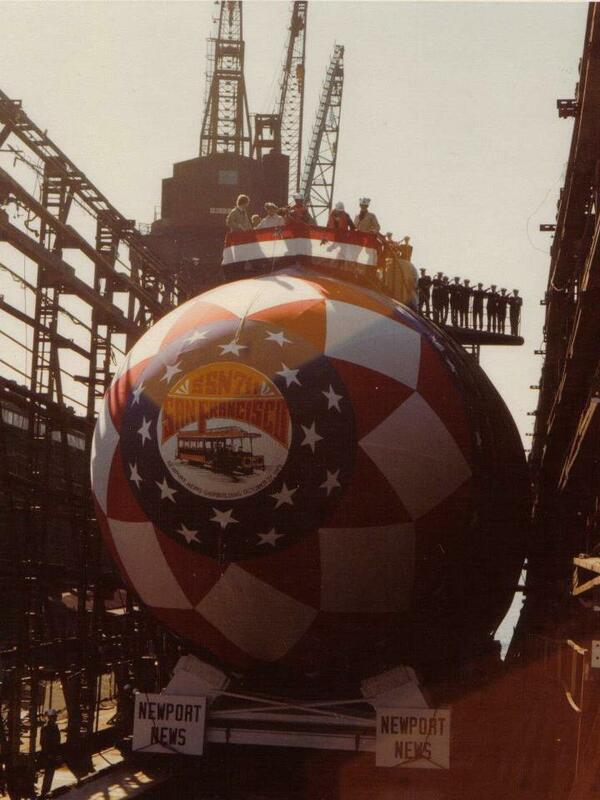 Newport News Shipbuilding and Dry Dock Company in Newport News, Virginia was awarded the contract to build USS San Francisco on 1 August 1975, and her keel was laid down on 26 May 1977. 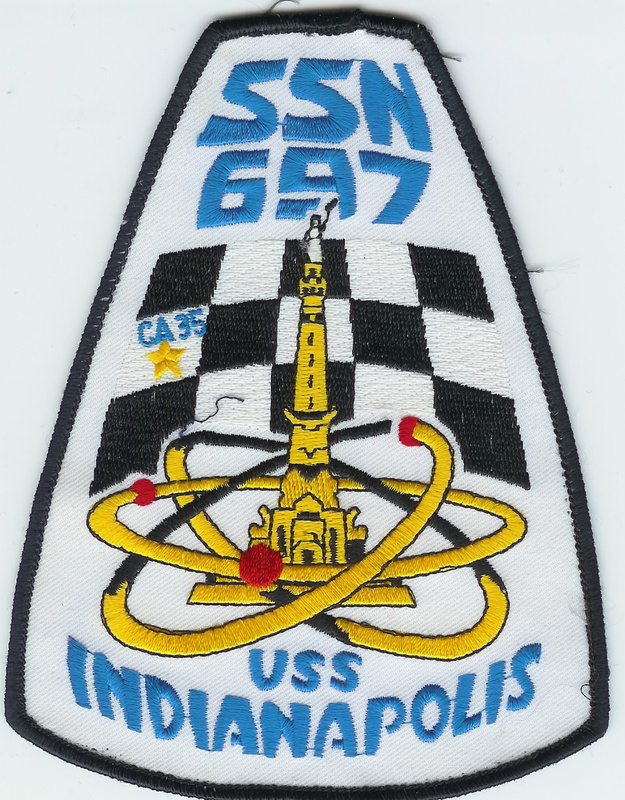 She was launched on 27 October 1979, sponsored by Mrs. Robert Y. Kaufman, and commissioned on 24 April 1981 with Commander J. Allen Marshall in command. What these words don’t reflect is how she got her soul. They also don’t tell you about how she changed so many people’s lives. For that story, you have to go back to pre-commissioning. Before I came to the shipyard to help build my new home, I had gone through a number of changes. I was a marginal sailor on two boats and had left active duty for a while to satisfy my former wife’s desire to go back home. Things did not go as planned and we ended up divorced and I had very little future ahead of me. Frankly, I could have just quit at that time. No one in my immediate family had ever been divorced and without an education or formal trade, I was wandering in the darkness. Then one afternoon, I got a call from a recruiter who had my name in his deck. He asked me what it would take to go back on active duty. Foolishly, I told him, get me on a brand new fast attack submarine and get me the hell out of range from all of the mess I had made on my own. He called me back the next day and offered me the chance to go to a pre-com unit in Newport News. I don’t think I hesitated much when I told him I would be right down to sign the papers. After clearing up what things I could, I found myself at the Norfolk Naval Station getting outfitted in a new uniform. Shortly after that, I was given directions to arrive on a cold morning at the shipyard and meet a guy named Petty Officer Taney. He was to become my LPO and would get me settled in housing. After checking in, we went down into the year and found the boat. What a mess. She had just barely been put in the water and there were holes in the hull where there should have been no holes. Wires and hoses and bulky ventilation lines were everywhere and the inside was filled with the smoke of welding. I still despise that smell. Acrid and uncomfortable, it burned your nose and made it hard to see. The hammering noises were also loud and obtrusive and everywhere you looked was chaos. To be honest, I wondered if I had made a mistake. But it was no mistake. I arrived as a new crewmember at just the right time. The crew was not fully manned yet so lots of opportunities presented themselves to learn and qualify. I spent every spare hour I could going over the systems one by one. Since I was newly single, I had all the time in the world to explore and learn. Week after week, the boat came together. Bunkrooms soon came into being and the operating equipment was tested and groomed and polished. You could start to see the shapes of the compartments as they would be when finished and the extra lines and leads slowly but surely started to disappear. 1980 was an exciting time as we learned the boat’s machinery and inner workings. New crew members continued to arrive and as they did more training sessions needed to be held. I quickly learned that I liked to train. It was a factor in much of the rest of my career and set me on the course of professional trainer. There was also an air of excitement in the Navy. The Carter administration had been hard on all of the armed forces up until the very end and a man named Ronald Reagan was running ahead of the crowd to send a new message that something was different. That old phrase about a New Day in America meant something to us. We were building a submarine that was going to be part of that new day. 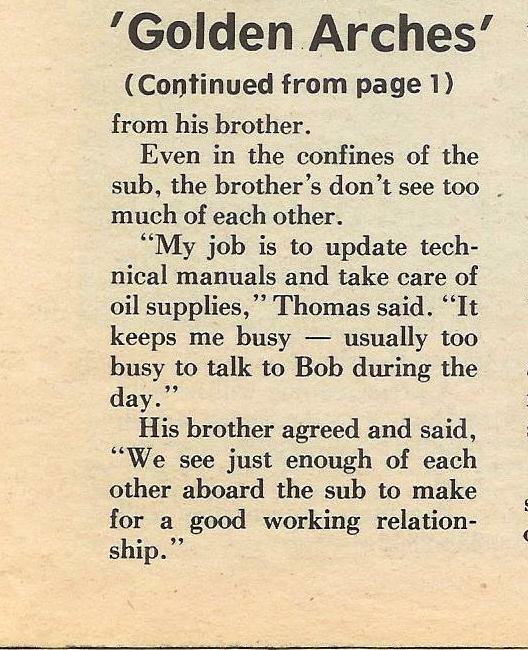 By April of 1981, sea trials were complete and the boat was nearly ready for her big day. Then word arrived that our commissioning date and location was changed. We would do the ceremony at the Norfolk Naval base and have two distinguished visitors. 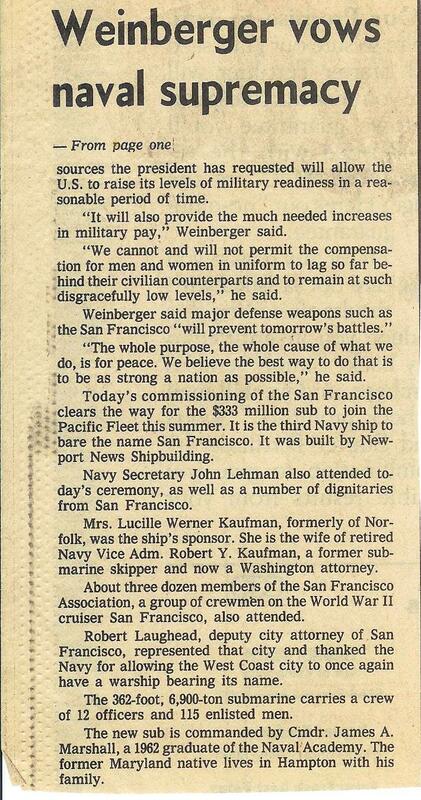 First, Casper Weinberger, the new Secretary of Defense would be the main speaker and coming with him was John Lehman, the new Secretary of the Navy. This was no ordinary commissioning for the Navy. Something big was about to be announced. On April 24th, 1981, an announcement did come. America was going to regain her preeminence in the world after the disastrous Iranian Hostage Mess. 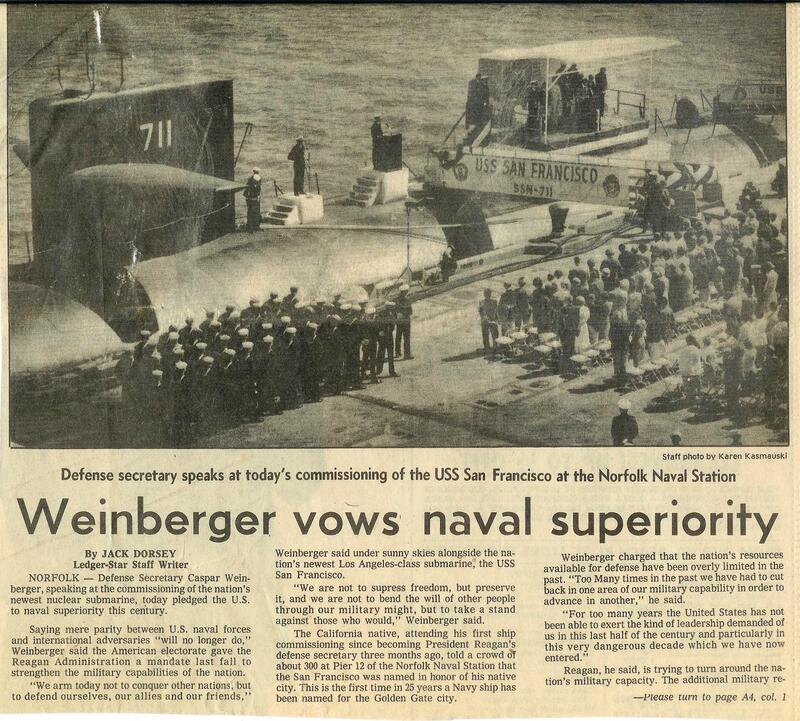 On the deck of the newly commissioned USS San Francisco, Casper Weinberger announced that the Navy was going to go into a rebuilding mode and restore the Navy to its grand place in the world. 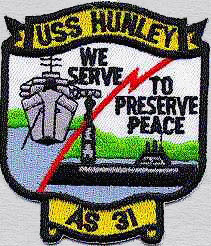 We would build a 600 ship Navy and counter every threat that existed in the world. In 1981, the Soviets were also strengthening their sea forces. They were challenging us in so many ways around the globe and a weakened US must have seemed like an easy target. The disaster in the desert where rescue helicopters faced defeat instead of glory, a tattered American image was shown to the world. This on top of the failure to secure a victory in South East Asia was a resounding signal that America had lost its way. This new effort was the beginning of a change that literally launched a new effort to bring back America. And all of that was happening on the back of the boat that we had built. In my mind at that time I thought, I am the luckiest sailor in the world. I got to be here when they announced that the Soviet Union nor any other enemy could push America around. 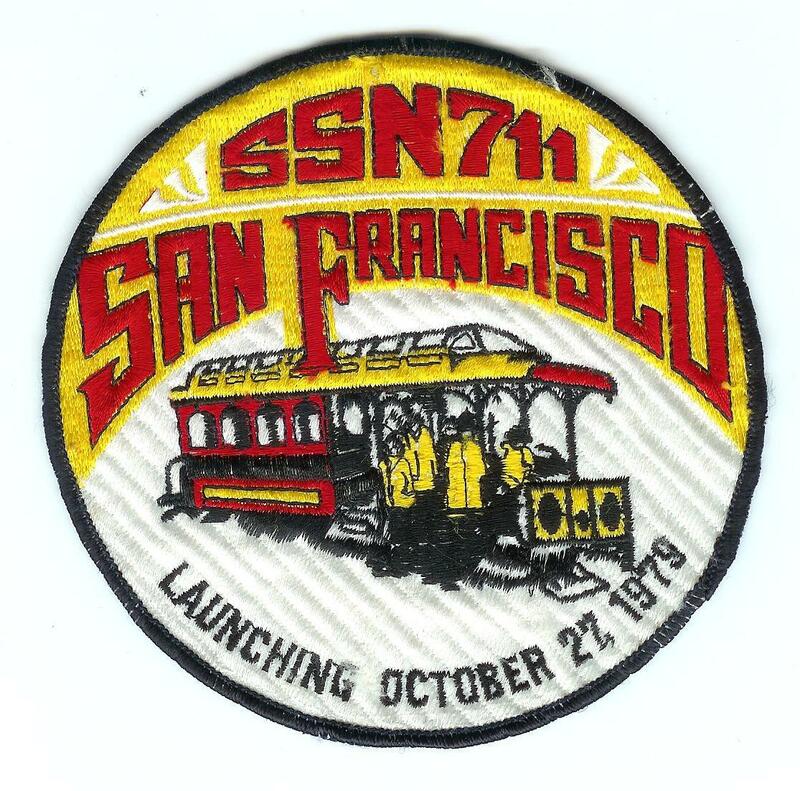 For the next three years, the San Francisco helped to prove that point. I am not able to tell you the stories I wish I could. You will just have to trust me that the boat earned her motto: Oro en Paz, Fierro en Guerra. I left her, but my heart never did. Probably why one of my favorite songs to this day which was sung by Tony Bennett still comes to mind when I think of her. The men that I sailed with on that boat were truly my brothers. Most are still that today nearly forty years after the fact. I owe so much to them that can never be repaid. From that original crew, many became leaders in their own rights. Other crews came and replaced us. The boat had her share of challenges long after we left. But the soul of that submarine lives on. She taught me how to be a better man and she taught me the significance of proper training. As she prepares to enter her new life as a Moored Training Ship, I can’t help but think how appropriate that is. Her spirit will inspire the next generation of submariners. I hope they will always know how special she is. Nextalt.submarine veterans … I wonder how many others are out there looking for a base?